Marcus Ecks starts out with a chuckle as he begins to describe his life in a nutshell. He says, "The best and worst stories of my life begin with, 'There was this girl...'"
You see, Marcus met one of the loves of his life, Charlene, at a transgender conference in Charlotte, North Carolina. He was living in South Carolina and she was living in Philadelphia. Charlene was a minister and 21-years his senior. Marcus said, "Charlene brought me back to my faith. She made me view my relationship with God differently. She was up front from the beginning about her HIV status but for the first time in my life I saw the possibility of having something I wanted almost more than anything and that was the ability to have natural children." That overwhelming desire to have children of his own made him take chances with HIV that he knew were risky. He said, "A short while after I found out Charlene was HIV-positive, I heard a voice tell me, 'You will get sick, but don't be afraid.' If I had to do it all over again, I'd have been more pro-active with my doctor but I was operating on blind faith and thought, 'God has my back.'" Marcus was also emboldened by the fact that for a year and a half his HIV tests, which he took regularly, had been coming back negative. "On January 7th, 2014 I went for my normal check-up and HIV test. I knew when the tester...I knew before she said anything that I had tested positive. I wasn't scared though. Charlene was very open about her status, gave a lot of talks and many members of my church were also open with their status. Charlene used to say. 'I'm not living with HIV, HIV is living with me.'" He continued, "More than anything, I didn't want Charlene to feel guilty. I knew she was going to take on the weight and she had so many other things to worry about." Charlene had various health problems, not necessarily related to HIV but her weakened immune system and drug resistance complicated any healing process. Marcus was working full-time and also taking care of Charlene until she passed away in April of 2015. "God works in mysterious ways. I was the worst diabetic ever! I was horrible with adherence - my A1C was 13.5 at one point and my doctor was telling me that if I didn't get it under control, I could expect amputations and other serious effects of uncontrolled diabetes. Through Charlene's struggles, I now realize how important adherence is for both HIV and diabetes and I'm honestly in the best health ever." He said. When God spoke to him and told him, "You will get sick, but don't be afraid," he really wasn't sure if it was a warning or a comfort and help for later on. But Marcus now says, "Through it all, Charlene helped me to grow. I grew up. It's been a beautiful journey and HIV is part of that journey. I like to remember my church motto: You are a beautiful creation of God." 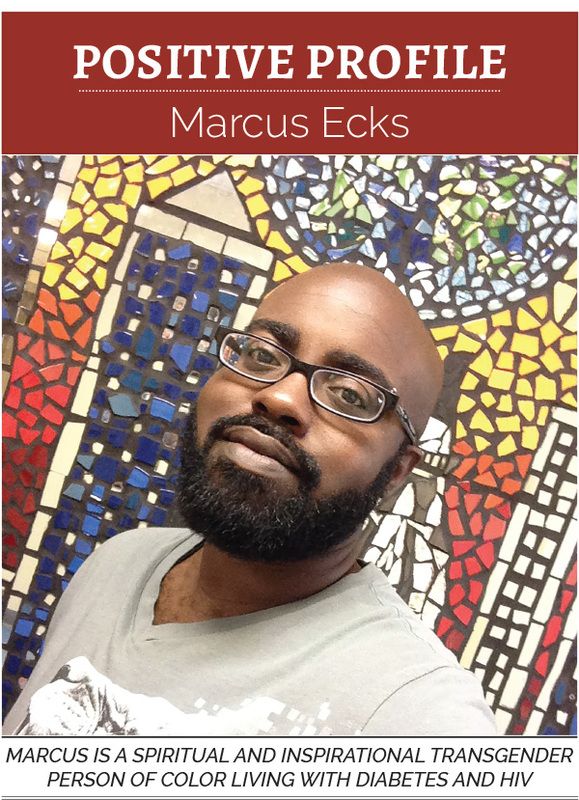 Marcus was ordained as a Deacon at his church last year and is studying to be a minister. He also finished an Associates Degree this past fall semester. His journey continues. He said, "The first time I really opened up about everything was on my video that I did recently. It was scarier for me to disclose my HIV status than my transgender status because of the stigma. I was afraid for the assumptions people would make. There was a shame that I felt at first but I had to work through it and process it. I knew in the video I had to be my authentic self because I can't help somebody be themselves if I can't be myself." His advice for someone newly diagnosed is, "Find support and don't isolate yourself. Whether it's a place of worship, family, friends or a solid support group, don't fall into yourself." Marcus wanted to end with the fact that God has kept his promise to him. He said, "Going back to faith and the promises of God or the creator, which ever you prefer, has been a round-about journey but everything I wanted I now have. I have a partner and we both have children. Trusting in someone higher than myself has been the highlight of my journey. God will keep his or her promises to you! NOTE: Transgender people with HIV and especially transgender people of color with HIV are a very underserved segment of the population that doesn't receive much notoriety. If you'd like more information or possibly some direction, please go online to The Transgender Law Center at www.transgenderlawcenter.org and find them on Facebook at www.facebook.com/translawcenter. If you'd like to see Marcus' video please go to https://youtu.be/plNXLSjeHpc.